A voyage towards health. Learn how an innovative partnership helped a family find a healthier future. Djaliou was born with a mass on his tongue that made it difficult to breathe, eat and grow. The odds were against him. But all that changed, thanks to his mother’s persistence, a team of highly skilled healthcare professionals, a dedicated non-profit and Abbott's innovative products. "My family said he was too tiny – he would die with surgery and die without surgery," said Djaliou's mother, Sara. "They told me not to bother taking him to the ship." That ship – the Africa Mercy – is the largest private hospital ship in the world, operated by the global charity Mercy Ships. For more than a decade, Abbott and the Abbott Fund have been important partners to Mercy Ships, donating laboratory equipment and life-saving nutritionals, as well as providing funding, to help the organization bring free, high-quality medical care to people in need. Djaliou would be no exception. Mercy Ships offered a free surgery to help save Djaliou's life. Despite Sara's family's concerns, she and her husband knew they couldn't give up. So, she packed a few belongings and made the 10-hour trek with Djaliou tucked close to her. When she arrived at the port of Cotonou in the West African nation of Benin, the reality of the situation set in. 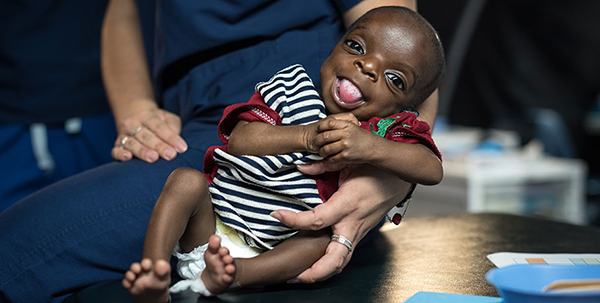 At just 4.7 pounds, Djaliou – then just three months old – weighed far too little for surgery. It was difficult for him to eat, but he had to gain weight before any procedure could be done. Djaliou in the pre-surgery screening tent. For nearly two months, Djaliou and his mother stayed at an outpatient facility provided by Mercy Ships. While there, he was put on Abbott's NeoSure formula for premature babies, which helped nourish him and get him to a healthy weight. As he grew, he transitioned to Abbott's Similac infant formula to help him grow strong. In addition to providing Djaliou with our nutrition products, the medical laboratory onboard the Africa Mercy helped assess Djaliou's progress before his surgery using Abbott's CELL-DYN Emerald hematology analyzers. Our Emerald instruments are used both during and after surgery to screen patients for adequate blood counts. All of this care helped prepare Djaliou for his day of surgery aboard the Africa Mercy, where a team of specialized doctors would work from morning till night to remove the mass from his tongue. The night before the surgery, though, the voices of Sara's family began to echo through her head. "I did not sleep," she recounted. "I was remembering what people had said – that my son would die during the operation." Djaliou's progress after the surgery was nothing short of amazing. He went from being unable to drink from a bottle at all – the mass on his tongue had taken up most of his mouth – to drinking on his own just four days after the surgery. And he could finally coo like other babies now that his tongue was small enough. 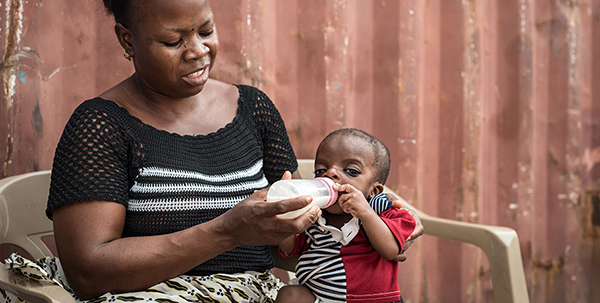 Following his successful surgery, Djaliou learns how to feed himself with help from his mother, Sara. As for Sara, she was eager to bring home the baby boy who many thought wouldn’t make it. "I want to show everyone he is alive," she said. Sara never gave up. Neither did the doctors and nurses on the Africa Mercy. And neither do we in working to bring innovative, life-saving products to people all over the world. For more information on Mercy Ships, including updates on the Africa Mercy's recent work in Benin, click here.